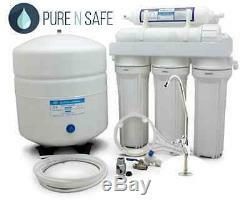 6 STAGE 50GPD Residential REVERSE OSMOSIS SYSTEM without Pump - RO WATER FILTER 50 GPD. Complete Filters Set Are Included. YOUR RO SYSTEM AND ITS PARTS IN THE PACKAGE. Reverse Osmosis System with five cartridges and all necessary filters include a 50GDP RO membrane filter. Accessories: Feed Water Valve, Tee Fitting, Tank Ball Valve, Goose Faucet chrome chose from two options, Pipe Plug (1/4''), Cartridge wrenches, Screw, and 40mm Drain Clamp. Accessories shape or colour might vary depend on the model. This model does not have a pump, if your water pressure is less than 5 bar, you might need a system with pump. This Reverse Osmosis Unit uses advanced reverse osmosis technique to provide healthy and testy drinking water to help you enjoy your life. The heart of the reverse osmosis Unit is a Reverse Osmosis Membrane with 0.0001 micron precision which totally removes the bacteria, heavy metal, salt , bad mineral substance and other dissolved matter and chemical drug in the running water. PP Spun Filter for removing the particles, dust, mud etc. Granular Carbon Filter for removing chlorine, organics, odor, smell turbidity etc. Block Carbon Filter for removing chlorine, organics, odor, smell turbidity etc Or Sediment Filter. RO membrane for removing bacteria, heavy metal, salt bad mineral substance and other dissolved matter and chemical drug in the running water. Post Carbon Filter for Adjusting the taste. Alkaline Filter for Adjusting the pH. Check our store for replacement cartridges. Above diagram is for demonstration only. Not all optional parts are available for this model. The item "6 stages undersink RO reverse osmosis water filter system with alkaline filter" is in sale since Wednesday, August 31, 2016. This item is in the category "Home Appliances\Small Kitchen Appliances\Water Purification\Water Filters". The seller is "purensafeaqua" and is located in Greenacre, NSW.